There’s a coffee shop in San Francisco called Philz. Their motto is: “One Cup at a Time.” The coffee counter person individually brews your cup, adding cream and sugar if requested (I get a dash of cream, no sugar) and a sprig of fresh mint. Nattie, my friend and coffee connoiseur, turned me on to their Philharmonic blend. Phil claims, “The Philharmonic’s delightfully orchestrated warm and balanced tones with harmonious layers of cardamom perform symphonies on the tongues of devoted coffee followers and the adventurous.” Wow Phil, that sounds mind-blowing! And, indeed, it is. It is a hotstrongboldnotbitter cup of joy. I’m convinced that the secret weapon to this cup of goodness lies in the cardamom. I’ve been a fan of adding a dash of ground cinnamon to my coffee for a while now, but cardamom is something new. 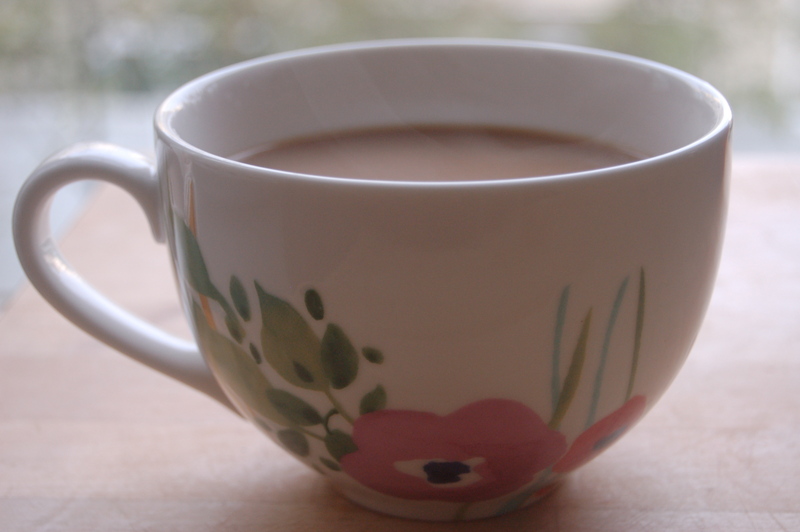 It’s a subtleslightlyspicyfloral addition that elevates a basic cup of coffee to the ethereal. I would go to Philz everyday if it weren’t for the cost issue. A cup of drip (granted, custom blended and served with a smile) costs at least three dollars. Far from a bargain. So, a few days ago I decided to invest in the necessary coffee supplies and brew my own Philharmonic. I’m tempted to call it my special Happelharmonic blend, but it doesn’t have quite the same ring to it. Beans from Blue Bottle Coffee, the very best in the Bay. 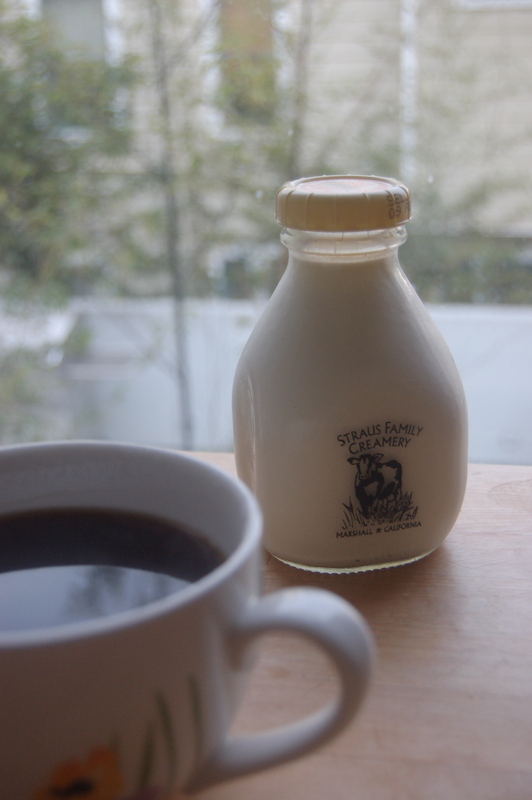 Half and half from Straus Family Creamery. Ground cardamom from the organic spice section at Whole Foods. And a pretty mug to savor my buzzybrew down to the last drop. It all came together so nicely. I’m not sure if it “performed a symphony on my tongue,” I guess I’d call it more of a “cardamom concerto.” Delicious, nonetheless. 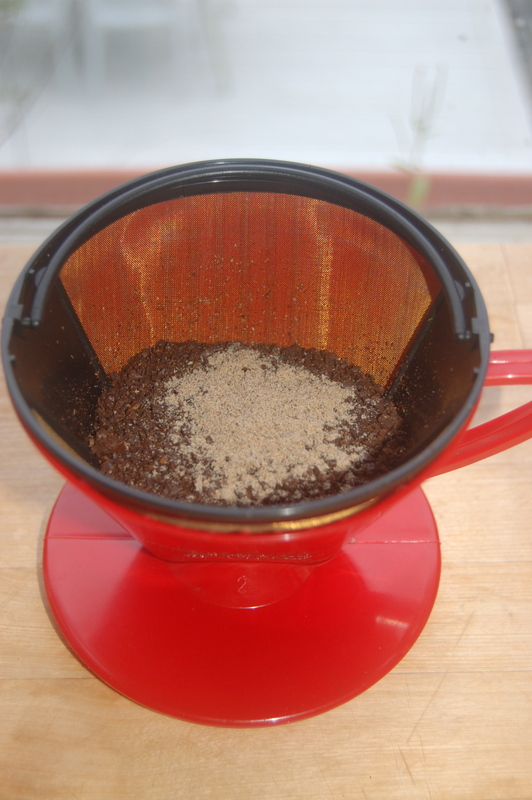 Combine coffee grounds and cardamom and brew coffee however you prefer. I use the filter ($2.99 at Sur La Table) drip method. Add a dash of half and half, sugar if you like it sweet, and mint. as much as I adore cardamom, it has never occured to me to do this. thanks for the tip! can’t wait to try it.